If you watch ABC’s Shark Tank (there is no shame in admitting you’re home on a Friday night — Friday is the new Thursday! Or pretend you DVR’d it! 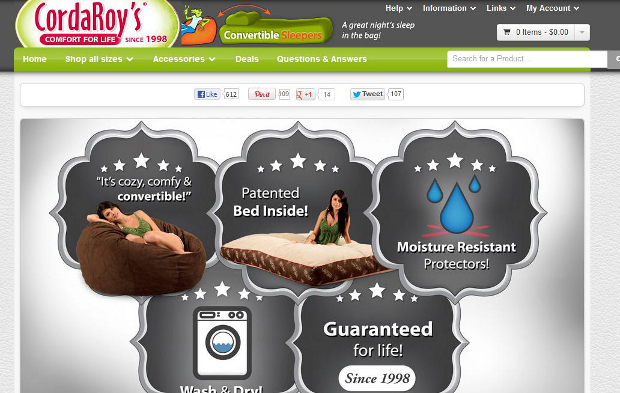 ), you may have seen Byron Young pitch CordaRoy’s — an ingenious bean bag chair with a bed inside. Yes, a bed inside. The sharks may not have been excited about doing a deal, but they all agreed the product was a great one. We adore this little-company-that-could and think the sky is the limit for them. Especially if they can master the fine art of integrating social with customer life-cycle management. Think about it: everyone needs a bed and who could say no to a classy beanbag chair? Ok, maybe a few people – but that leads us to the point: How can CordaRoy’s find the people who can’t say no? How can CordaRoy’s turn social activity into real, measurable business? We’re not talking about Tweets that say, “I need a beanbag chair with a bed inside” (if only marketing were that easy!). You have to cast a wider net. Fortunately, with proper social media management, people Facebooking everything they eat and tweeting when they’re going to bed, it’s not as hard as it sounds. What’s more, they don’t have to focus just on the functional benefits. Thanks to HGTV and those ubiquitous Home Depot commercials (spoiler alert: installing a tile backsplash is not “a fun and easy weekend project”!) everyone is DIY-ing, decorating, and repurposing rooms. This is good news for CordaRoy’s. They should target people posting about man caves, family rooms, playrooms, game rooms, basements, etc. The good news is these are all things people talk about on social media. They are telling you what they need. Listen to them! Sometimes it’s appropriate to directly engage with someone on social media by sending them a direct message or tweet. For example, when your prospect has a need, offer a special deal. Perhaps a parent posts about turning their college-bound son’s room into a craft room . . . CordaRoy’s could target them with a 2-for-1 offer. Their son could get one for his dorm and they could get one for their craft room. Maybe a previous customer is posting about one of the above scenarios – CordaRoy’s could offer them a special VIP deal. This is Customer Life-Cycle Management 101 but with the added layer of social media. Since it’s basically happening in real time, it becomes Customer Life-Cycle Management 1012. Lastly, CordaRoy’s should be sure to watch for trends in common interests amongst their target market. For example, if the upcoming release of Call of Combat 7: The Shooting is generating a lot of buzz, CordaRoy’s could create an entire campaign around the release, perhaps even offering a gaming system and beanbag as a prize. The combined interest in comfortable seating and digital combat is well-documented (somewhere, we imagine) and capitalizing on those interests is sure to be a hit that will drive increased interest and sales. Much to our surprise, once they become a customer, people do not just enter a black hole. CordaRoy’s should monitor their conversations through social media: check in to make sure they are satisfied, ask for referrals, and track their needs. They could also offer special deals for repeat purchases, gifts, etc. Using social media to track and manage the customer life-cycle makes sense for CordaRoy’s and all small to medium size businesses looking to grow in this new social world. Every Tweet, +1, “Like”, and YouTube video can be a great way to connect with customers and turn social media activity into real measurable business. Do you monitor social media to find new customers, keep the ones you have happy, and to bring them back for more? Tell us how you’re getting creative with social media monitoring.